Spotted a fascinating discussion of some of Google’s recent UX design changes to various of their apps, and some excellent responses. The discussion started with Kevin Fox, a former lead designer on many of Google’s premier apps. 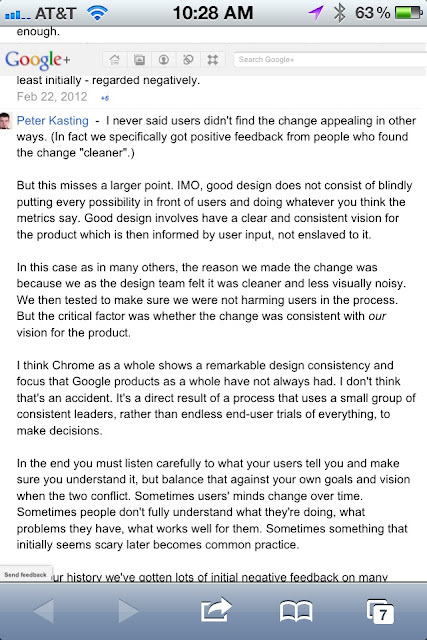 The responses include at least a couple of *current* uX designers from Google, including the response from Peter Kasting I snapshot’d in the enclosed image. I note this especially as something inspirational to my own career as a UX designer – user feedback is essential, but not the whole story, and a strong design vision is just as essential to ensuring continuity, clarity and consistency. I live my life these days walking that fine tightrope, and I appreciate those others who share their own experience of it.